Best of the Best 1001-1100. Type: BOOKS. Detail: SAHOVSKI. Product Code: 9788672970616. In the second half of the 20th century, the game of chess swept around the world. The Royal Game had become a game of the people. Chess Informant appeared in 1966, collecting some of the most precious games created by chess players. From millions of games played at some of the most important tournaments worldwide, hundreds of thousands of them have been published in Chess Informant. In addition, each volume has featured a selection of the ten best games of the previous volume, as selected and voted by a jury of grandmasters. Back in 2008 we presented a new book, featuring the complete collection of these ten best games from each of the first 100 issues of Chess Informant The Best of the Best 1000. That book stands alone as a unique tribute to excellence in chess, as well as a comprehensive guide to the best creative achievements of the strongest players in the period 19662007, including games from World Championship matches, Olympiads and all toplevel tournaments of that era truly an amazing collection, fully deserving of its title. 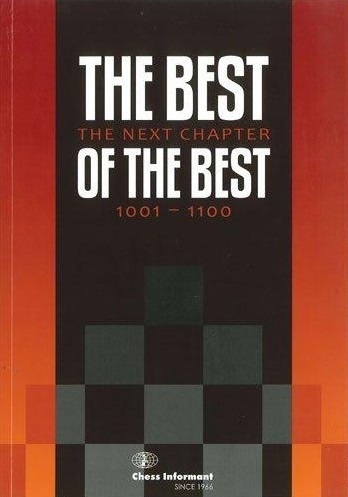 The book you are holding aims to sustain the tradition, by collecting the hundred best games of volumes 101110, ten of each volume, spanning a period of four years (20072011). These games have been methodically selected and strictly evaluated by such esteemed grandmasters as A.Beliavsky, L.Christiansen, M.Gurevich, Mi.Marin, A.Mikhalchishin, Z.Ribli, J.Speelman, former womens World Champion Xie Jun and the President of Chess Informant, A.Matanovic. The games include spectacular victories by World Champion V.Anand, former World Champions V.Kramnik and V.Topalov, the strongest ever female chess player J.Polgar, as well as other top players such as V.Ivanchuk, A.Volokitin, V.Akopian, L.Dominguez, R.Ponomariov and A.Shirov. We wish you will enjoy this attractive and entertaining collection, the Best of the Best of Chess Informant 101110! Softback 104 pages. Informant 88 +CD. SAHOVSKI. $4.95.